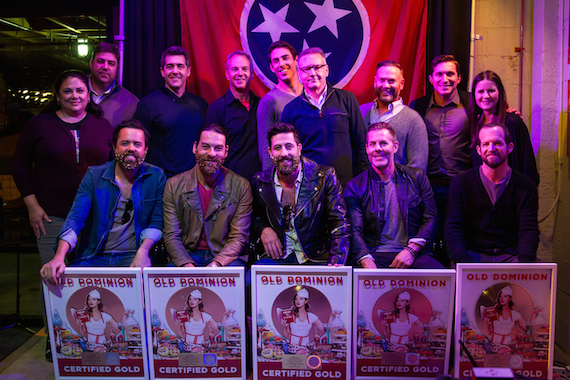 Tennessee Brew Works in Nashville was the site for a celebration ceremony for the Gold certification of Old Dominion’s debut album, Meat And Candy. Band members Matthew Ramsey, Brad Tursi, and Geoff Sprung were in the spirit of the event with gold glittered beards. Along with Trevor Rosen and Whit Sellers, the band was praised on stage by Sony Music Nashville CEO, Randy Goodman. “One of the first albums I listened to when I came back to work at Sony was Meat And Candy,” said Goodman. He went on to list the certifications that the radio singles received. This included their first No. 1 single, “Break Up With Him,” which was certified platinum. “Snapback” went gold and was the most streamed song for Sony Nashville in 2016. Their latest single, “Song For Another Time,” was also certified gold. The band was invited to the stage to be awarded their plaques for the gold certification of the album. The band then surprised the guests with the name of their next single, “There’s No Such Thing As A Broken Heart.” It will be the first from their next album. The event concluded with the new single being played throughout the bar.